We're still a long ways from the 2TB SDXC cards we were promised. But that doesn't mean my jaw's not dropping a little to see Lexar's 128GB SDXC card. And then dropping a little lower at the price. At $700, the card's clearly aimed at the professional market. 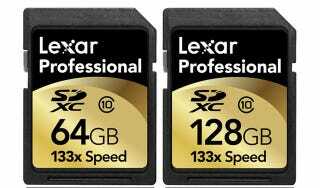 But considering that just a year ago we were agog over a 64GB SDXC card, it's best to think of this more as a neat technological breakthrough than something to add to your shopping list. And at the rate prices tend to plummet on SDXC, it may not be long before you don't have to choose between rent and flash storage.